Thanksgiving is the poor middle child of holidays. It doesn't get the respect that it deserves, and it might be the holiday we need the most. No, not the American history of imperialism part. But the simple spending a day at home focused on family and gratitude. I am suspicious that a holiday's "importance" is directly connected to how much money you are supposed to spend on it. It goes to show that the war on holidays, traditions and families is really being waged by commerce more than anything else. And gratitude doesn't sell well, because when we realize that we already have everything we need, what do we need to shop for? This is exactly why stores can never really push Thanksgiving, but also exactly why we should make it loom larger in our own lives. 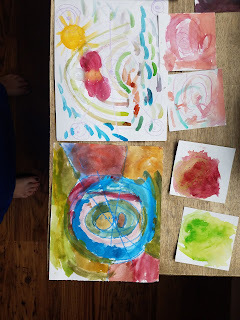 So, we are trying to give this holiday more attention, more energy, and creativity. We want that gratitude to be deeply felt, and not treat this moment like the kickoff to Christmas shopping. Enough, already. Here are some ideas for being intentional about Thanksgiving. These are all great traditions, and you could totally combine them to suit your family. Happy Thanksgiving! 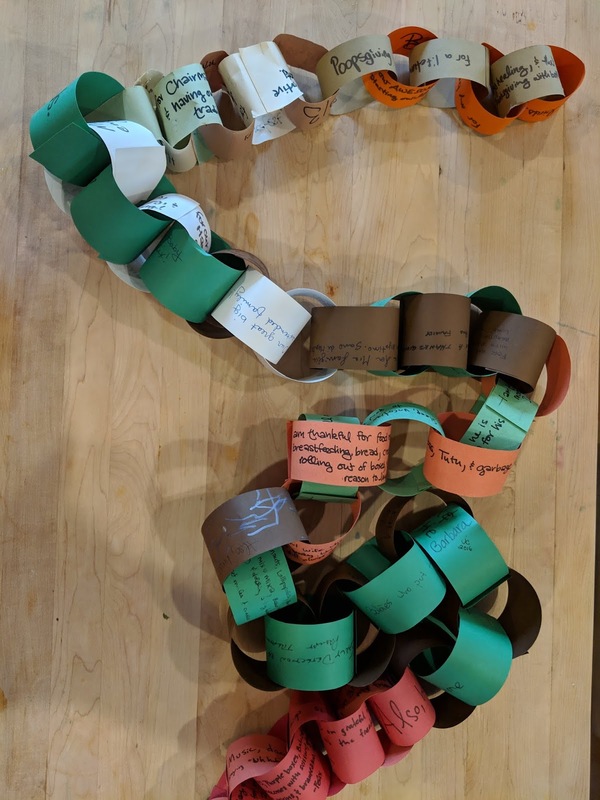 Each family member gets two paper chains to say what they are thankful for. 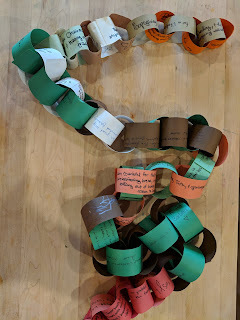 We read them together, and then add them to the paper chain we started our first Thanksgiving as a married couple. Now 6 years (and more family members) later, the chain is long enough to hang. I am excited to see how long it gets one day! We shamelessly stole this idea from my Aunt Joanna, and I am sharing it so you can shamelessly steal it from us. It's a good, sometimes bittersweet, reminder of just how much there is to be thankful for. This is a holiday about gratitude and mercy. It's a story about how a group of people (pilgrims) were absolutely lost, and another groups of people showed them so much mercy and love to help them survive. We know that in the hundreds of years after, American tribes have been grossly mistreated. It's not right, and we can do something about it. We don't have the power to change that history (no matter how much we might want to), but we know that is a population that can really use our help now. They have a super high rate of suicide (especially young people), their reservations tend to be in problematic areas (think pipelines, radiation, all sorts of nonsense. Environmental issues are ALWAYS class issues too, and the most vulnerable economically are the most vulnerable environmentally as well), and are even losing their voting rights. First step? Figure out whose land you are living on, and research how you can help those tribes. We owe everything to them, so let's build them up. Need more info? I thought this website was a helpful starting place. Pick an organization and give them the money you were planning to spend on Black Friday. It will do way more good than a new flat screen tv ever could. Instead of just celebrating what you are thankful for one day a year, you could make being thankful a year-long tradition. Set out a large glass jar with a lid and a bunch of pieces of paper. You can probably find one used, if not an extra large Ball jar or this jar from Anchor Hocking would work. People can write things they are grateful for all year long and drop them in, and then on Thanksgiving, you can read them all. What a great way to remember and be grateful! My mom's family is BIG (she is one of 8) so even if attendance isn't that great, most of our family Thanksgivings are still pretty huge. So we each write down what we are Thankful for (without writing our name), and then one person reads them all and everyone guesses who said what. It always makes us laugh, some years it has made us all cry, and it is one of my favorite family traditions. 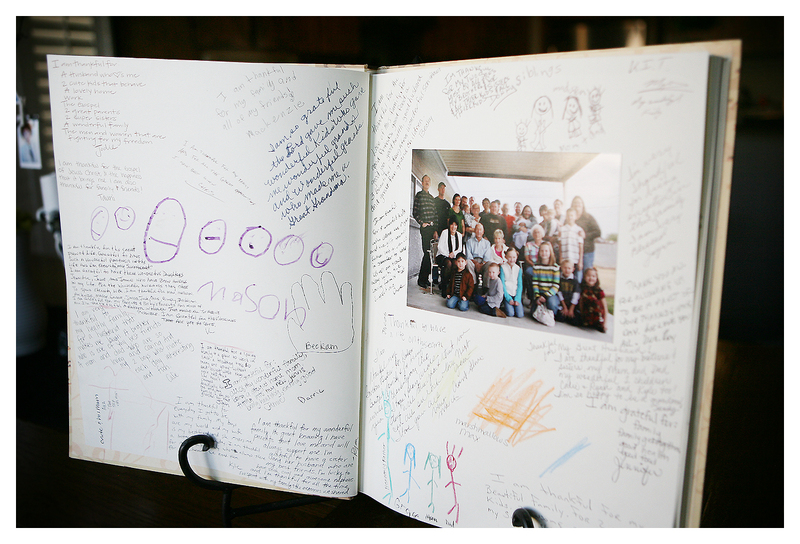 I have seen some beautiful family books where they each write what they are grateful every year. These looks really special to me, and would be fun and easy to read (and store! Our paper chain is going to take up some serious room!). I absolutely love this one from Eighteen25- how special is that? And the baby handprint is killing me. Another option is to keep a family journal all year long, and then you can read through it on Thanksgiving. 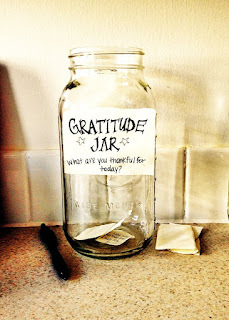 I love this idea, because it keeps thankfulness at the center of your family culture all year long. 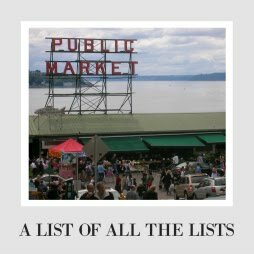 In the days and weeks leading up to Thanksgiving, take stock of the places you have abundance- it could be food, books, clothes, toys. And give them away. Give as much away as you can leading up to Thanksgiving. You could donate it or gift it away on a Buy Nothing or Freecycle group. Either way, you will reach Thanksgiving with less, but you will feel more thankful. Make a tradition to send five people cards telling them why you are thankful for having them in your lives. Can you imagine receiving a letter like that? Wouldn't it be so special? We all keep going through our daily lives, trying to make a positive difference, but it can be hard to know if we are doing any good. Turn that gratitude into action by simply putting it into words. People will treasure it, and you will show your kids that being that vulnerable only makes the world better. Want to make it even better? 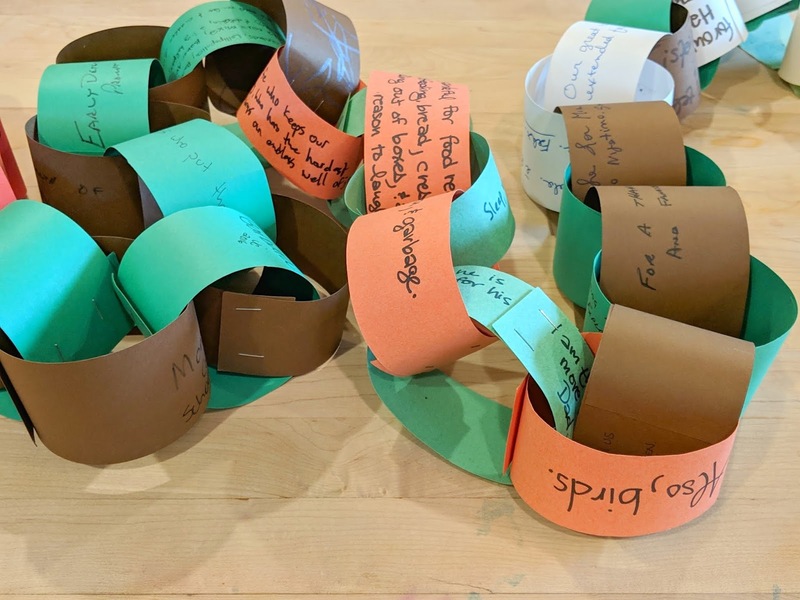 Involve kids who aren't writing yet? Make your cards. I love these. You can make a tree from branches outside (or if you live in a climate that is still warm, you could buy something small to plant each year). 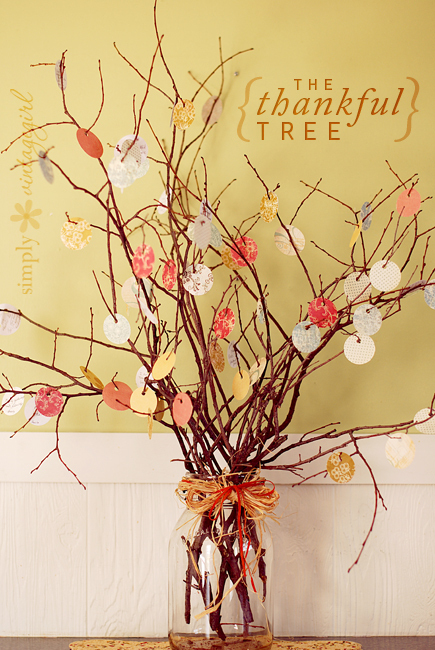 Then, each family member can write something they are thankful for (often on little leaves) and hang them on the tree. 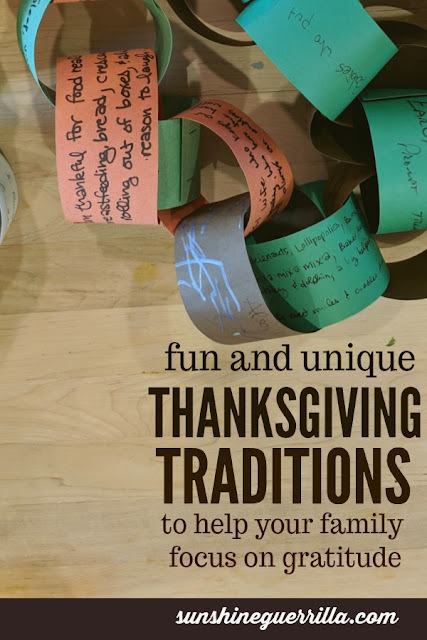 These look beautiful (you have to love a tradition that multitasks as a decoration) and celebrate what we are thankful for! I love this one from Simply Vintage Girl. For a really kid-oriented one, check this out from Raising Arrows. Work off all those delicious carbs and take a long walk outside. The quiet of nature can really give everyone a minute to think, and it might be a better choice if you think your clan is too cool for the more cutesy traditions. Our environment gives us most of the best things we constantly take for granted- simple things like air, food, heat, any ability to live, etc. Show your gratitude (and your stewardship) by honoring it and taking care of it. If you are in a climate where you can, plant a tree every Thanksgiving. 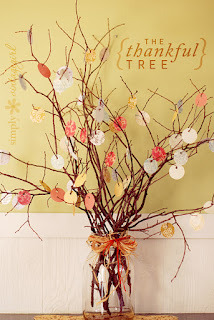 Start a Gratitude Grove (not sure which tree? The Arbor Day Foundation can help). Go clean up the community that raised you or rake leaves for your neighbors. It's all good labor. Have the desire to help but not the physical ability? Check if there are any groups near you "greening" your area. If not, consider donating to the Arbor Day Foundation or Nature Conservancy. There are so many ways to decorate using things you are grateful for. Put up a huge piece of paper and let everyone add onto the same page. Hand out index cards for words and drawings, then hang them all up in a big wall of gratitude. Buy a plain white tablecloth and fabric markers, and let people add their thank you's every year until it's stuffed like a turkey. You could even do little paintings if you have a particularly creative crowd! Because of the way our society is organized, for you to have a lot, someone else has a little. If you are grateful for what you have, the best way to put that gratitude into action is to go help. Donate food to a foodbank or go serve food at a shelter (better yet, pick a day and work at that shelter every month instead... they get a lot of help near Thanksgiving but can be short on help at other times). What challenges are people facing where you are? You can help, and that in itself is so amazing and worth being thankful for. Want more eco-friendly ideas for your holidays? Want a family that focuses on experiences and gratitude instead of stuff? 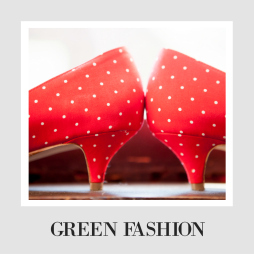 Check out our Green Family Page. We have TONS of ideas. I 💗💗💗 the paper chain and thankful tree!!! I’m definitely going to do these with my girls! Love this post! Most especially the thankful tree. Our preschool did something similar, where they had the kids put their handprint on a gratitude wall and then write something that they were thankful for. Such a clear and visual lesson in showing thanks for the positives in your life. We talk about something we are thankful for every night at dinner. We also talk about our favorite and least favorite part of our days. Helps kids with perspective!